The Utah State quarterback is on a roll. In the past four games, he has scored 45, 1, 40 and 31 fantasy points, and is the fourth-ranked CFF QB with 988 passing yards, 13 aerial strikes and two touchdowns on the ground. The one stinker came against Wyoming, a difficult matchup, on the road. The Rainbows are the 128th rated pass defense in the nation (2,566 yards), allowing 256 yards per game and 22 touchdowns. With a high-game total projected by Las Vegas, Love is a great option to insert into lineups this weekend. He should manufacture over 30 points for the fourth time in five games. Watching Sam Hartman play this season is like teaching sophomores U.S. History: At times, the scholars are incredible critical thinkers who are engaged in the learning process while other days the youngsters have no interest and are overwhelmed by the intellectual challenge. Against Notre Dame and Clemson at home, Hartman looked sophomoric, scoring only 8.5 fantasy points in the two loses. In the other six games, the Wake Forest passer played with confidence and poise: He scored 29, 16, 28, 23, 30 and 31 points. The Demon Deacons are a home underdog with a gigantic projected total. There is no question that Hartman puts plenty of points on the board against a defense that surrenders 28.6 points per game. CFF owners might be reluctant to acquire Nate Stanley, and insert the Hawkeyes’ starter into lineups. In the past two games, he has been a major disappointment with only 291 passing yards and one touchdown. However, it is a new week, and Stanley is in a great spot to rebound. Before the slump, the junior had passed for 1,199 yards and 14 touchdowns in the previous four games. For the season, the Boilermakers score over 32 points per game, and put 49 points on the board against Ohio State two weeks ago at home. Iowa will have to score to remain in the game versus Purdue, and Stanley passes for over 300 yards and two touchdowns for the fourth time this season. Two Independent programs do not draw the attention of the national media. However, sharp CFF Diehards examine every matchup in the entire FBS. The Flames travel north to take on the Minutemen, and a fantasy feast awaits for those who belly up at the buffet. In the last five games, Frankie Hickson has garnered over 20 carries, eclipsed the century mark twice and scored six times. UMass is defensively challenged and are the 130th ranked run defense in the country, permitting over 270 yards per game and 24 touchdowns. Any starting runner in a game forecasted to harvest ten touchdowns must be acquired and inserted into lineups. South Florida has won seven of eight games despite a run defense rated among the bottom ten units in the country. The Bulls are bleeding well over 200 yards per game on the ground and opponents have totaled 18 rushing touchdowns. A junior, Darius Bradwell is the alpha dog in the Green Wave ground game. He has produced double-digit fantasy points in four consecutive games and scored five touchdowns. At 6-foot-1 and 225 pounds, Bradwell owns a nice combination of size and speed and is difficult to bring down in one-on-one matchups. 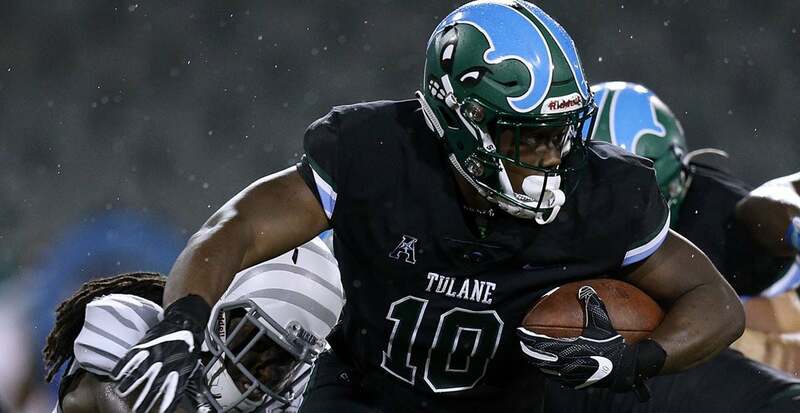 Tulane employs a spread-option rushing attack, and Bradwell will surely see some wide-open rushing lanes against the Bulls. I know…two runners in the American Athletic Conference this week. Please bear with me. Sophomore Shamari Brooks leads the Golden Hurricane in every major rushing category with 158 carries for 623 yards and six touchdowns. Last year against the Huskies in Connecticut, Brooks scampered for 164 yards on 31 attempts and scored two touchdowns. On Fantrax, the Tulsa runner was only active on 37% of teams last week, but CFF owners should promote Brooks into their lineups against UConn at home. The Green Wave are huge favorites and might gain over 300 yards on the ground, which bodes well for Brooks to have a mammoth fantasy game. Anticipating the Houston-SMU shootout reminds me of going on wilderness adventures as a kid with my brothers. Without question, it would be exciting and entertaining and we would surely find something interesting—or daring—to do. The Cougars’ D’Eriq King stands above the CFF rankings with 336 points scored. He has played incredible football this season. The Mustangs do not have the defenders to slow down the Houston passing game, and Ben Hicks will likely throw over 45 passes to keep the game close. In the past two games, the Senior has attempted 83 passes, completed 43 for 619 yards and chucked five touchdowns. Reggie Roberson has benefited greatly from Hicks increased attempts with 14 receptions for 246 yards and three touchdowns. A transfer from West Virginia, Roberson is beginning to dominate opponents, and the game script as a home underdog foreshadows a big outing for the Mustangs receiving corps. I have a dilemma this week. My 14-year old son wants to see Venom on Saturday, and I like to attend matinees to save a little money. However, I really desire to watch the Syracuse-Wake Forest game; therefore, I may have to pay more for tickets in order to catch the noon kick off. Senior Eric Dungy has only four scheduled games remaining in his college career, and maybe a fifth, if the Orange get a likely bowl invite. Jamal Custis and Nykeim Johnson have both played well the past two weeks: Johnson corralled 12 passes for 238 yards and two touchdowns while Custis snatched 10 passes for 242 yards and two touchdowns. Both are worth a flier in starting lineups on Saturday. I will make a decision on watching Venom or the Syracuse-Wake Forest game in the near future.